The heirloom tomatoes are coming in at Pepper Place and I’m a huge fan. We buy them every chance we can get. 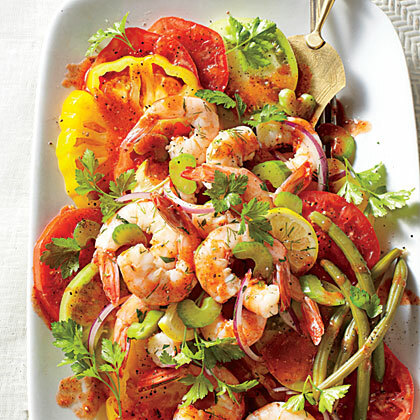 Personally, I can eat them like an apple, but this recipe is the perfect marriage of those tomatoes with some fresh Gulf shrimp! Using a chilled serving platter, arrange the sliced tomatoes and celery. Sprinkle with cracked black pepper and sea salt to taste. Drizzle with the Bloody Mary Vinaigrette (recipe below) and spoon the pickled shrimp over the top (also below). Top with the celery leaves and garnish with pickled okra or pickled green beans. You can even add some crumbled Feta if you’d like! Combine ingredients in a bottle with a lid, shake and chill. In a zip top freezer bag (gallon size), add 1 pound of medium-sized peeled fresh shrimp. To the bag, add the following ingredients, then place the bag in your refrigerator for at least 2 hours but the longer you leave it in, the better. After 6 hours the shrimp will get rubbery, so 2-6 hours is the processing time. It’s official.. I’m 40 and fat! In an attempt to lose some weight, I’ve been trying to eat healthier food. We’ve been buying a lot of fish and chicken in place of red meat and pork, and we’re watching our fiber intake. Lower fat and higher fiber seem to be the new trend in weight loss, along with exercise. 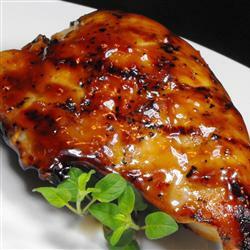 Tonight we’re having some grilled tuna fillets that are marinating in an Asian-inspired sauce right now. To go with our fish, I whipped up this refreshing Asian style salad. It’s flavorful and high in fiber, but it does have some fat because of the peanut butter. Still, it’s a healthy alternative to a high fat side dish and it’s delicious… and simple. Simplicity is my main requirement when I find or create a recipe, because now that I spend my whole day in a kitchen at work, I like to get out of the kitchen as quickly as possible in the evenings. Give this one a try and I think you’ll be pleased with the results! In a large mixing bowl, prepare the dressing by mixing together everything from the peanut butter to the water. 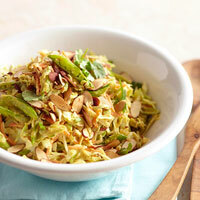 Toss in the slaw mix and fold well to combine. Add peas, jicama and green onions. Toss and cover. Refrigerate for at least 30 minutes or up to several hours. Garnish with toasted almonds and cilantro.